1 Rank of New Orleans in fastest growing US cities between 2010 and 2011. Source: Census Bureau. 1 Rank of New Orleans, Louisiana in world prison rate. Louisiana imprisons more of its people, per head, than any of the other 50 states. Louisiana rate is five times higher than Iran, 13 times higher than China and 20 times Germany. In Louisiana, one in 86 adults is in prison. In New Orleans, one in 14 black men is behind bars. In New Orleans, one of every seven black men is in prison, on parole or on probation. Source: Times-Picayune. 2 Rank of New Orleans in rate of homelessness among US cities. Source: 2012 Report of National Alliance to End Homelessness. 2 Rank of New Orleans in highest income inequality for cities of over 10,000 Source: Census. 3 Days a week the New Orleans daily paper, the Times-Picayune, will start publishing and delivering the paper this fall and switch to internet only on other days. (See 44 below). Source: The Times-Picayune. 10 Rate that New Orleans murders occur compared to US average. According to FBI reports, the national average is 5 murders per 100,000. The Louisiana average is 12 per 100,000. New Orleans reported 175 murders last year or 50 murders per 100,000 residents. Source: WWL TV. 13 Rank of New Orleans in FBI overall crime rate rankings. Source: Congressional Quarterly. 15 Number of police officer-involved shootings in New Orleans so far in 2012. In all of 2011 there were 16. Source: Independent Police Monitor. 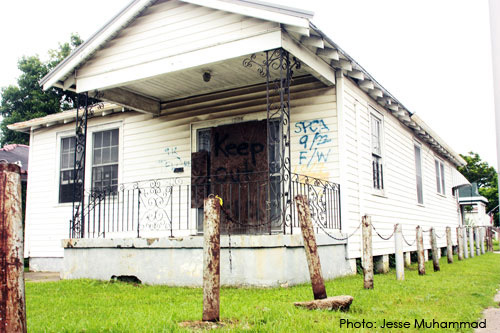 21 Percent of all residential addresses in New Orleans that are abandoned or blighted. There were 35,700 abandoned or blighted homes and empty lots in New Orleans (21% of all residential addresses), a reduction from 43,755 in 2010 (when it was 34% of all addresses). Compare to Detroit (24%), Cleveland (19%), and Baltimore (14%). Source: Greater New Orleans Community Data Center (GNOCDC). 27 Percent of people in New Orleans live in poverty. The national rate is 15%. Among African American families the rate is 30% and for white families it is 8%. Source: Corporation for Enterprise Development (CEFD) and Greater New Orleans Community Data Center (GNOCDC) Assets & Opportunity Profile: New Orleans (August 2012). 33 Percent of low income mothers in New Orleans study who were still suffering Post Traumatic Stress symptoms five years after Katrina. Source: Princeton University Study. 34 Bus routes in New Orleans now. There were 89 before Katrina. Source: RTA data. 40 Percent of poor adults in New Orleans region that work. One quarter of these people work full-time and still remain poor. Source: GNOCDC. 42 Percent of the children in New Orleans who live in poverty. The rate for black children is 65 percent compared to less than 1 percent for whites. Source: Census. 44 Rank of Louisiana among the 50 states in broadband internet access. New Orleans has 40 to 60 percent access. Source: The Lens. 60 Percent of New Orleans which is African American. Before Katrina the number was 67. Source: GNOCDC. 60 Percent of renters in New Orleans are paying more than 30 percent of their income on rent and utilities, up from 51 percent in 2004. Source: GNOCDC. 68 Percent of public school children in New Orleans who attend schools that pass state standards. In 2003-2004 it was 28 percent. Source: GNOCDC. 75 Percent of public school students in New Orleans who are enrolled in charter schools. Source: Wall Street Journal. This is the highest percentage in the US by far, with District of Columbia coming in second at 39 percent. Sources: Wall Street Journal and National Alliance for Public Charter Schools. 76 Number of homes rebuilt by Make It Right Foundation. Source: New York Times. 123,934 Fewer people in New Orleans now than in 2000. The Census reported the 2011 population of New Orleans source as 360,740. The 2000 population was 484,674. Source: Census.